It may sound paradoxical, but capturing the ultrafast motions of subatomic particles is actually very time-consuming. Experiments designed to track the dynamics of electrons often take weeks. Mapping the frantic gyrations of elementary particles entails the use of extraordinarily brief laser pulses, and low signal-to-noise ratios necessitate the accumulation of huge datasets over long periods. Now Physicists based at LMU Munich involved in the MEGAS Project – a research collaboration between Max Planck Institute for Quantum Optics, LMU Munich and the Fraunhofer Institutes for Applied Optics and Precision Engineering and for Laser Technology – have significantly reduced the duration of such experiments. The core element of their new technique is a novel enhancement resonator. 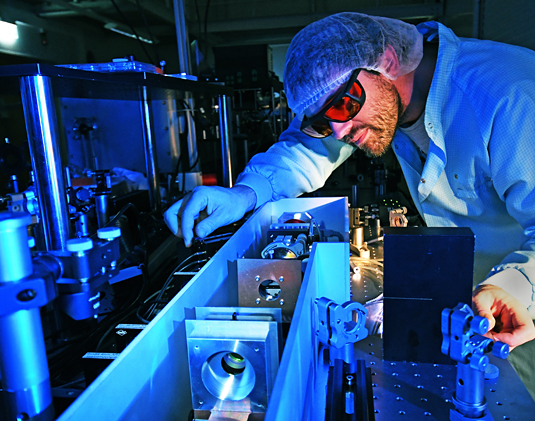 Ultrashort, near-infrared laser pulses delivered to the cavity at a rate of 18.4 million per second are converted into extreme ultraviolet attosecond pulse trains, which are ideally suited for experiments in electron dynamics.